Just to add something to keep the emails and PM's down. If you are still breathing and you do anything around the house or in other working setting including office work you are exposed to more things that are bad for you! A little common sense can go a long way. Whether you consider yourself an artist or not! With the constant ever changing research being done into the health effects of the materials around us, both in and out of the shop. Due to the sort and long term effects on our bodies. It is becoming a must for the artist/fabricator/Shop person to stay on top of it. This book sort of fell into my hands when I was carrying a box of books I purchased. After reading some of it. This should become mandatory reading . All these years Turpentine has been label as safe, how many of us didn’t give a second thought about using it to wash or body parts off after an oil paint session. Having been in sign painting back in the day when One Shot lead based paint was the weapon of choice. As the lead was the reason for the great coverage, in the beginning of the hazard awaking the MEK’s Methyl Ethyl Ketone and its cousins were the ones that we were warned against. The Relative Toxicity Rating for MEK is skin contact MODERATE, inhalation: MODERATE, ingestion MODERATE. The Relative Toxicity Rating for TURPENTINE is skin contact: HIGH, inhalation: HIGH, ingestion: HIGH. Who would have thought that! What was also interesting is that ACETONE TLV 500ppm skin and inhalation: both SLIGHT, ingestion: Moderate. The book is divided into three sections: Part One is: How Art Material Affect You. This covers the Basic problem, Risk factors, Effects on the bodies systems, Solvents and aerosol sprays and Acids and alkalis. The second part is: Hazards of various media With any number of them that are of interest to the metal worker, home shop person. From painting, stone, clay, and wax, wood, plastics welding metal working, jewelry, enameling stained glass, glassblowing to children and art materials. The third part is: Safety in the Studio, covering Materials, Safer materials Processes, Ventilation, Storage Handling, Housekeeping, Fire prevention and the Personal protective equipment and how to get help. What you need to tell the doctors if you are having problems. And they can’t find a cause, since most doctors aren’t use to treating material related illnesses. It is a good Idea for you to keep your own MSDS of what you use so if you are not able to communicate your family can provide info. There are newer editions out of this book. So when looking for a used copy get latest you can. 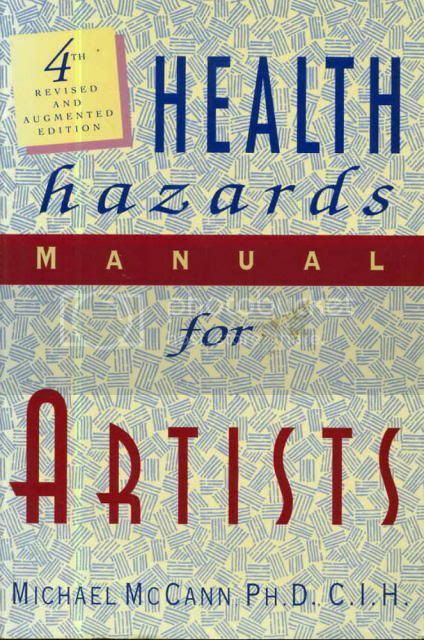 Re: Health hazards for shop people and others! Thank you for posting this one. I know for me the MEK versus Turpentine is a BIG eye opener. Your welcome! It was a lucky thing I bought the box of books as it looked to only have two in the dozen That I had any interest in. As things turned out, I really should put my glasses on. Looked into it as my interest got piqued, I found these other two online used and got both of them. Another more complete one by him and one by the Godmother of art safety who started a stage safety web site that sadly is no longer up and running due to the foundation loosing the grant money. I have to finish writing the third review which I will post soon. If you do a amazon all of these should come up.